©Photo by Tony Mould - click on image to open large version in a new window. The avenue of Fagus Sylvatica Dawyck beech trees in Hove Cemetery (South) was planted by Brighton and Hove City Council in March 2018 to commemorate the centenary of the end of World War I. Each tree represents approximately 100 men from the city who gave their lives in the conflict. 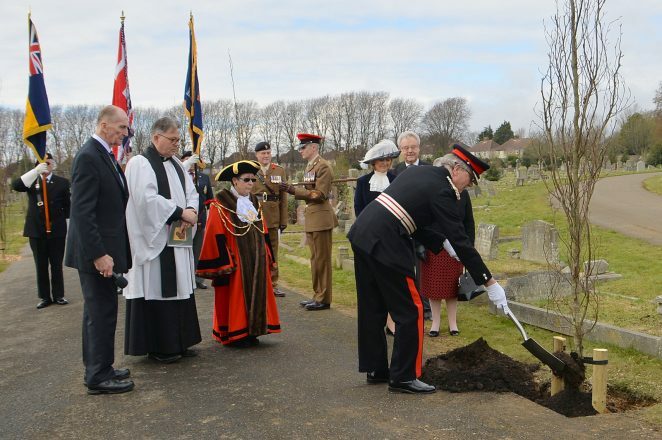 Our photograph shows the Lord Lieutenant of East Sussex, Peter Field, planting the final tree. The ceremony was also attended by the High Sheriff of East Sussex, Mrs Maureen Chowen; the Mayor of Brighton and Hove, Councillor Mo Marsh; representatives from Brighton and Hove City Council, and representatives of local veterans associations. My grandfather was one of those soldiers who died, can you please let me know where this avenue is? Sorry Roger – have added the location above. As each tree represents 100 men from the city who gave their lives, perhaps their names could be put in a plaque against each tree .